In my online executive programme, the New Growth Playbook – How to Transform your Business Model for the Digital Economy, I share some inspiring case studies of maverick organisations from around the world that have re-conceived their business models and dramatically outperformed the market. In this article I share some analysis of Xiaomi (‘sha-oh-me’), an 8 year old Chinese ‘Unicorn’ that is planning to raise $10bn via an IPO this year. It’s likely to be valued somewhere between $50-100bn, making it one of the biggest IPOs in recent times. I describe Xiaomi’s business model, as it has been, is today and how it could evolve, and suggest 4 key lessons for leaders in any sector or geography who are looking for new ideas about how they create and capture value in an increasingly digital economy. Xiaomi is a maverick Chinese company with a maverick leader that defies easy categorisation. Most people see it as a smartphone manufacturer that is on track this year to overtake Apple and Huawei to become the world’s second biggest after Samsung. However it describes itself, in its IPO filing, as something rather different: ‘We are an internet company with smartphones and smart hardware connected by an IoT platform at its core’. It does sell very high spec phones and devices, but at very low prices (and razor thin margins), and does so in order to create a marketplace for other connected products, digital services, entertainment and ‘lifestyle’ products and services. Mi.com is the third largest e-commerce site in China. This is almost the reverse approach of Apple, which sells high spec phones at high prices and margin, using 3rd party apps to drive demand for its phone manufacturing business. But like Apple, Xiaomi sees its future in services and the Internet of Things, based on a platform-enabled growth strategy, orchestrating an ecosystem of innovation around it. There are many aspects of Xiaomi that are impressive, particularly how it has invested heavily in nurturing an army of ‘Mi-fans’ who give it rapid feedback and ideas via interactive forums. Users spend at least 4.5 hours on their Xiaomi devices, which creates opportunities to monetise. This is a key part of the ecosystem strategy that has proved so successful in sustaining its growth, even after it suffered a significant decline in sales between 2014 and 2016. Xiaomi’s smartphones and a wide range of other hardware (TV’s, fitness trackers, rice cookers) run on its own proprietary operating system, built on the Android kernel, called MIUI. It makes most of its profits from the digital services which support or are accessed through the devices - movies, games, even micro-loans and wealth management services – and from advertising. 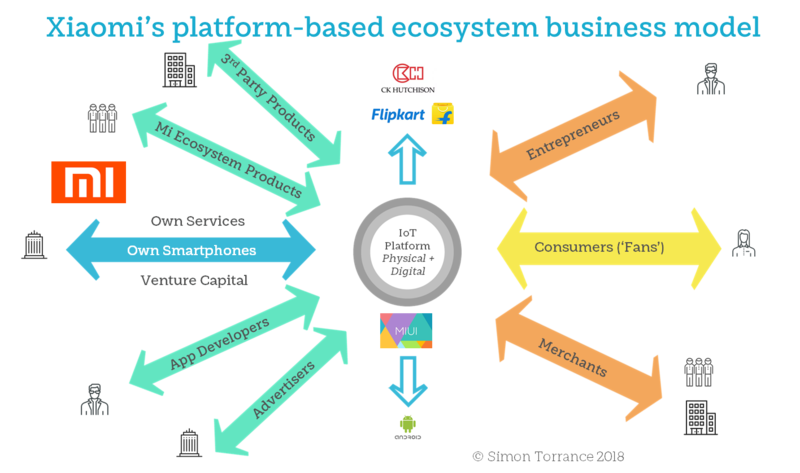 Like all successful platform businesses it doesn’t try to provide all of these services itself, but has created a rich ecosystem of third parties around it, who leverage Xiaomi’s brand, customer base, billing capabilities and, even, venture capital. This last point is one of Xiaomi’s uniquenesses. It stimulates the growth of its ecosystem by providing venture funding to start ups to create products and services that can then be sold into its ecosystem. Over the last five years it has invested $4bn in over 450 companies, four of which have themselves become ‘Unicorns’ (ie. valued over $1bn). It is now making $1bn available to fund 100 Indian start-ups over the next few years as it builds on its successful partnership with Flipkart in that market where it is also now the biggest smartphone vendor. As part of its continual process of re-evaluating how it creates and captures value, Xiaomi recognised the need to quickly move from online only sales to face to face and has invested in its own ‘Mi Home’ physical retail stores, with plans to expand to 2000 by 2019. In these it showcases all the physical products that it and its ecosystem members make. To expand internationally it is forming partnerships with companies like CK Hutchison in Europe and Asia. The products that are sold through its physical and digital channels are connected via its operating system to a single IoT software platform. It sees a future of seamlessly inter-connecting Mi and non-Mi branded products in and around the ‘smart home’: cookers, health monitors, phones, TVs, vacuum cleaners, electric scooters and air purifiers, supported and augmented by apps and online services. So, thinking about Xiaomi as a device manufacturer misses the mark. Its business model combines aspects of Amazon, Netflix, Tencent, Apple and also Softbank’s Vision Fund. 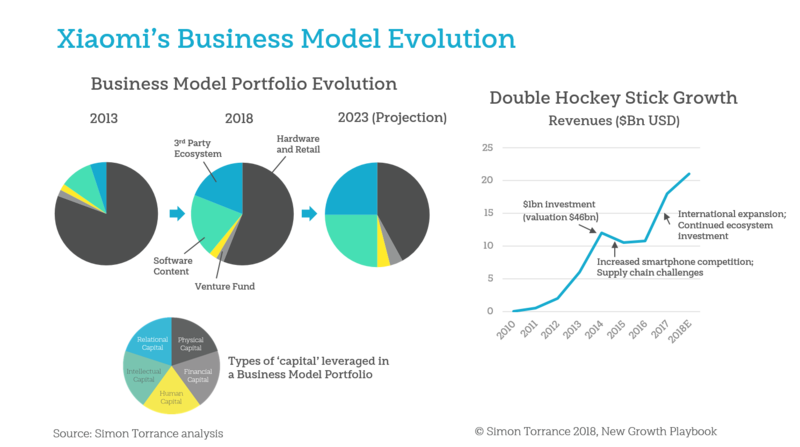 The diagram below shows how Xiaomi’s business model has evolved, in terms of where it has focused its investments in time, energy, skills as well as money. It has already created a very different portfolio to traditional competitors. The money it raises from its IPO will go into greater R&D and IP development (especially around AI), continuing to create high quality hardware, building more digital services (which have much higher margins), international expansion (for scale) and, most importantly, enriching and expanding its platform-powered ecosystem (for building defensible ‘moats’ and sustaining growth). 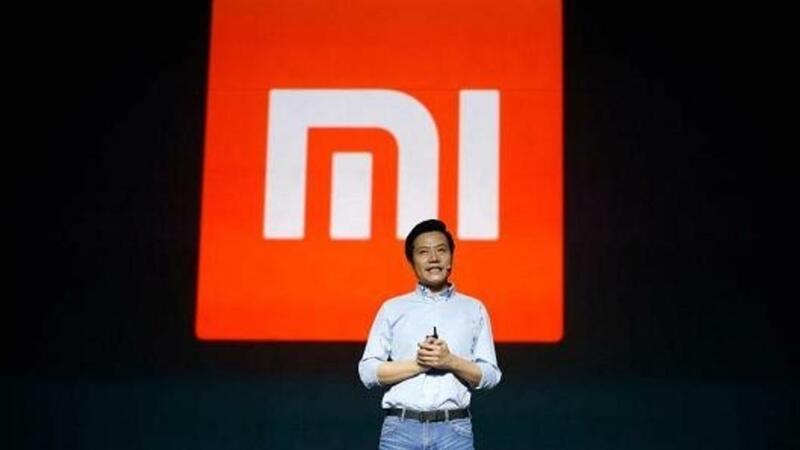 Leadership: Xiaomi is run by Lei Jun, a professional investor as well as an entrepreneur. Some people call him the ‘Steve Jobs of China’, but he’s also a mix of Jeff Bezos (Day1 culture), Masayoshi Son (big vision) and Bill Gurley (tech dealmaker). Successful leaders in the digital economy need to think like investors and understand the economics of software and platforms, or surround them with people who do. Culture: People refer to the ‘Xiaomi Way’. It has focused on nurturing a grass-roots fan-base (‘Mi-fans’) to help co-design products and evangelise them. This has created deep loyalty as well as crowd-sourced innovation. Xiaomi has invested heavily in both the infrastructure and skills to manage and nurture its fans. Dynamic Capital Re-Allocation: even when it was under significant competitive pressure after 2014 Xiaomi boldly allocated more capital to business model elements that could re-start exponential growth and support long-term sustainability: in particular its continued investment in its digital platform and its unique approach to ecosystem orchestration. It took a mid to long-term view and doubled up on its investments, rather than retrenching and cutting costs. Clear Vision, Big Ambitions: Xiaomi is not sitting still. It understands that the physical and digital worlds are merging and becoming hyperconnected, and that platform-based business models are the best way to enable and exploit this fundamental, global trend.